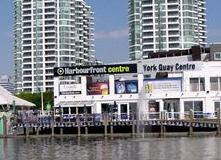 Harbourfront Centre offers both entertainment, culture and education. Below is a list of the courses they offer this winter. Harbourfront Centre’s Courses & Workshops provide adults and families with exciting, fun and creative learning experiences! Explore a new genre! Expand a skill! Embark upon a learning adventure of a lifetime! Harbourfront Centre’s stimulating Courses & Workshops return for a third year with a wide range of new programmes including creative workshops for families. The fall semester of Courses & Workshops runs from October to December, 2007. Register early as courses and workshops require a minimum number of participants. To register or for more information, the public can call 416-952-4046 or visit www.harbourfrontcentre.com/courses. We are trying to inform as many area residents as possible. If you have a newsletter, could we be included? Would you be able to post this information on your website or distribute in any other available manner to area residents? Please see information below. If you click onto the document below, it links directly to our Courses & Workshops website that contains complete programme information. The vacant building on Queens Quay West that formerly housed the Bamboo will soon become a Pet Community and Discovery Centre. 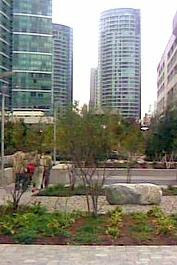 The building is owned by the City and managed by Harbourfront Centre. They have been looking for a suitable tenant for several years. 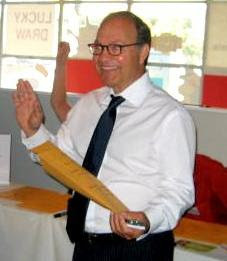 At a reception on September 11th in the York Quay Centre, Bill Boyle, Harbourfront Centre’s CEO, introduced spokespeople representing the Nestle-Purina Corporation. They announced their plans and enthusiasm to have an opportunity to “give back to the community”. As the new tenants of this space, Nestle-Purina shared their plans to develop an animal hall of fame and to plan activities to help individuals and families learn more about how to care for and have fun with their pets. They asked people attending the reception to offer any ideas they might have and promised that they will welcome community input to their planning process. Watch for signs of change as they begin to do extensive renovations to the building in the near future. Sun and fun garage sale! YQNA had a successful Garage Sale at the Radisson Hotel on Sunday, September 23rd, 2007. An energetic group of members on Queens Quay pulled it all together. They filled the empty store front with donations from condos in our area; they promoted the event and brought in plenty of customers; and they got volunteers working for four days. The sun was shining on YQNA in more ways than one, because we raised $1,500. As an added bonus, we had a lot of fun working together and meeting new people in the neighbourhood. We’ll keep most of the proceeds for YQNA projects, but a generous donation of $500 went to the scholarship fund for underprivileged youth, sponsored by our friends at Toronto Police 52 Division. A huge thank you to the Radisson Admiral Hotel for the generous donation of space and furnishings for this event, and for their continued hospitality at our bi-monthly meetings. A new walking path called South Linear Park has just opened in our neighbourhood. It runs east-west from Spadina Avenue to Yonge Street just north of the Gardiner Expressway. Since most of the condo tower population move around the city without a car, this green and attractive path was created in partnership with Concord Adex to get people quickly and safely on foot to Union Station and other downtown locations. The Linear Park will eventually be expanded all the way to Bathurst Street. Our city planner Al Rezoski, who has guided this project, promises to look for a better name than South Linear Park. Ideas, anyone? 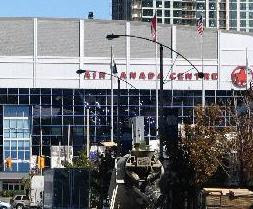 YQNA’s Planning and Development Committee is following the exciting square that is planned west of Air Canada Centre. It will hold 4000 people. ACC developers are applying for a permit for a large video screen to entertain the crowds. It would be 11 by 6.4 meters and about 10 meters off the ground. The ACC wants to add amplified sound as well as advertisements from sponsors. In other words, it will be like a giant TV. The neighbouring Maple Leaf Square appears to have a hotel facing this proposed screen. It could be challenging to have hotel rooms facing this over-sized screen, and the sound would travel upwards into condos and offices above. Another application for a giant video screen in the same area comes from Maple Leaf Square. When the plans for this huge development were first presented to the public, we were assured that no over-sized video screens would be allowed – and certainly no sound and definitely not giant advertisements. Now they are all popping up. YQNA is working with councillor Pam McConnell on reining in this trend to plaster the Waterfront with giant screens and more noise.